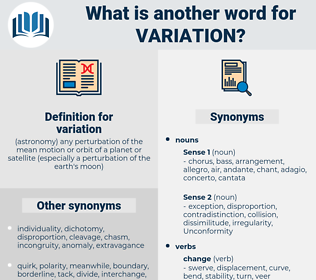 What is another word for variation? PAGES, fluctuation, Les, variety, diversity, modulation, diversification, shift, mutation, distinction, dependence, volatility, relaxation, dispersion, evolution, fluctuating, pattern, transformation, inequality, varying, contrast, contrasts, accommodation. differentiation, disparity, variability, variance, modification, alternative. unity, facsimile, homogeneousness, equality, copy, uniformity, conformity, likeness. steadiness, permanence, firmness, continuance, fixity, constancy, unchangeableness, persistence, fixation, invariability, stabilization, fixedness, identity. Yes, more particularly, although there is but little more variation among the men. The lameness caused by it is subject to variation. 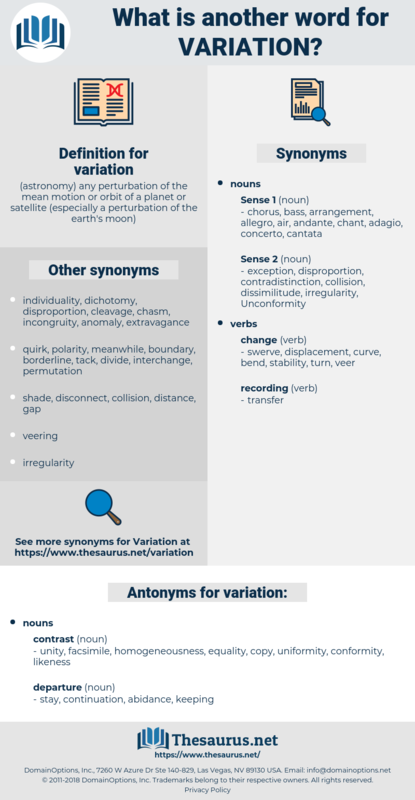 daily variation, vicissitude, diurnal variation, business cycle, transposition, divergence, tide, trade cycle, departure, switch, replacement, deviation, permutation, substitution, difference, allomerism. terpsichore, dancing, activity, dance, saltation, change. theme, melodic theme, idea, musical theme.